Criminal Defense Jacksonville, FL - Criminal, Personal Injury & Family Lawyers | Finnell, McGuinness, Nezami & Andux P.A. Don't delay, even if you are not sure you need a lawyer, call us today for peace of mind. Been hurt or injured in an auto accident? No one plans to get arrested, no one expects a marriage to fail. Accidents happen and sadly people get hurt. Sometimes bad things happen to good people. Sometimes it’s just plain bad luck. There are times in life when you simply cannot face these challenges alone. You need a lawyer. Someone who will help you get your life back on the right path. That someone is actually the law firm of Finnell, McGuinness, Nezami & Andux, P.A. Experienced, knowledgeable attorneys that live and work in the same community as you. In our 100 combined years of practice, we’ve seen and heard it all, from major federal crimes to minor traffic offenses. We treat each case as if it were our only case. If you’ve been arrested in Duval County, St. Johns County, Nassau County, Volusia County or Clay County or just need someone to talk to, give us a call at (904) 791-1101 or (904) 264-8602. After all, what are neighbors for? Founded on the steadfast belief in doing what's right for our clients, Finnell, McGuinness, Nezami & Andux is a Criminal Defense firm serving Duval County and the surrounding areas. We've built and staked our reputations on getting the best possible outcome for our clients. Every case is important, no matter how big or small. 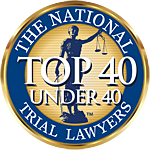 Our senior trial attorneys pride themselves on knowing the law and using it your advantage. We are experienced in handling case as simple as traffic tickets and as complex as homicide. If you have been injured in an accident due to another’s carelessness, you may be able to recover your damages. However, time is of the essence. If you wait to long you may be barred form making a claim. Our personal injury attorneys have years of knowledge representing clients who have been injured and can help you learn more about personal injury and whether or not you are eligible for recovery. We approach family law and divorce in a straightforward manner. We strive to find peaceful solutions while protecting your rights. We strive to minimize discord and strive to help everyone prioritize the children’s interests. Our experienced family lawyers understand the need to protect your assets, your business and your ability to earn income and provide for your family. Although end-of-life planning can be a difficult subject, it is important for you to deal with these issues so you and your family can be protected in case something unexpected happens. Let our experienced attorneys guide you through these difficult decisions and give you peace of mind. If you or a loved one has been arrested for a DUI, we realize this can be an embarrassing and traumatic experience. Our experienced DUI attorneys know how to fight DUI charges by contesting field sobriety test, breath test or blood draws. Our DUI Attorneys who have the trial experience necessary to expose the weaknesses in the state’s case. Most of us have had to deal with the authorities regarding a traffic ticket or infraction. Traffic tickets can be an expensive frustration of both your time and financial resources. However, most people are not aware that they have options after being ticketed. Don't take the points! At FMNA, we are prepared to guide you through the complicated immigration process of filing a family petition. We can also guide you through the naturalization process so you can become a citizen of the United States and reap all the benefits that citizenship offers. If you or your loved one is not a United States citizen, it is extremely important that you consult with an immigration attorney if you have been arrested or are involved in a criminal investigation. Not all attorneys choose to represent clients in federal court. Our attorneys have the knowledge and experience in federal court to handle your federal case. Attorneys Gonzalo Andux, Ann E. Finnell, Vanessa Newtson and BeJae Shelton are all experienced trial attorneys admitted to practice in the Middle District. Vanessa Newtson is an active member of the Criminal Justice Act Panel and attorney Iryna Kharlap was recently admitted to practice in the Middle District. If you’ve had your civil rights violated by the government, you need a strong and experienced law firm to defend you and uphold the Constitution. Whether you’ve been hurt by a local municipality, a state actor or the United States government, our attorneys have the experience, expertise and resources necessary to defend your rights, hold the government accountable and ensure you are compensated for your damages. We handle all cases from divorce, personal injury, DUI and more. We have defended clients in countless criminal trials and are certified and experienced practitioners in both Florida State and Federal Courts. Our firm also has death-penalty certified practitioners who have represented many clients in capital cases. The best legal minds in North Florida working to protect you and what matters most to you. Every case is important, no matter how big or small. Because it’s your case. If you think that you may be under investigation by any law enforcement agency or you have been arrested but formal charges have not been filed, now is the time to get a trusted and experienced attorney. An attorney can often work quickly to prevent charges from being filed against you and to safeguard your rights. Swift action by an attorney may prevent law enforcement from violating your rights.